Battling for their lives in the arena, Anakin and Obi-Wan Kenobi clash against thousands of Geonosian Warriors in a grueling confrontation. As Geonosians attack, Anakin uses the Force to retrieve a second lightsaber and prepares to defend himself at all costs. Contribute pictures, update details or suggest corrections for Anakin Skywalker (Lightsaber Slashing Action). 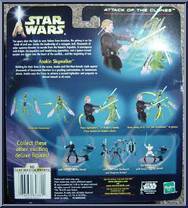 Write a review about Anakin Skywalker (Lightsaber Slashing Action).